I was having a look out the window today and noticed the silver birch stump (about 4ft tall) has what appears to be chicken of the wood growing in several places. I've never seen this on the stump before. I read up about it and it says the growth is May to September. The link below is what it looks like. Also, if it is chicken of the wood, why would it be growing now? That doesn't look like CotW or silver birch. Do you have a picture of the actual fungi? 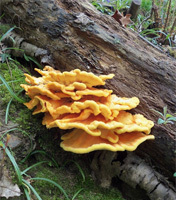 I have seen some yellow fungus growing on a tree stump a week or so back but it wasn't Chicken of the woods. Neither is that in the photo. It could be honey fungus. The colour can be quite variable. True MR. Would you eat it based on that observation ? Definitely NOT COTW! This is COTW. i would want a better set of photos inc a section and gill form to give owt but a possible id . I think honey fungus is edible, but would always check with a good authority before eating. Also I wouldn't eat anything I wasn't hundred percent certain about the ID. Be interested to see what the picture is like. Sulphur tuft on the other hand, to which some of our people have pointed, is one of those "poisonous" mushrooms which blight the popular books. 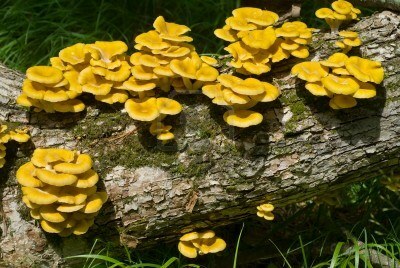 There are truly deadly funghi which grow on logs, but I don't really think those in the photo are in this category. However, I don't like "might be's" pointing to edible toadstools in a frivolous way. I'm sure we would feel pretty bad if a novice were to rely on those uninformed guesses and end up dead ! If it turns out to be COTW or even one of the Honey Funghi - You owe it to posterity to eat a portion !